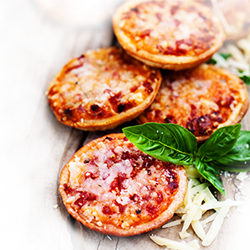 Description: KetoVie Café Pizza Petites are ketogenic diet friendly mini cheese pizzas. They have a 3:1 ketogenic ratio with only 3 g net carbs (total carbs minus total fiber). KetoVie Café Pizza Petites may be incorporated into the daily meals and snacks of individuals following the spectrum of ketogenic diets. Each package contains 8 delicious mini pizzas. KetoVie is designed for individuals over one year of age and indicated for the dietary management of intractable epilepsy and other conditions managed by a ketogenic diet. Preparation: Preheat oven to 400° F. Unwrap pizza. Place on greased baking sheet and bake for 9-10 minutes or until cheese has melted. Directions for use: Consume within 3 days of receipt. For extended shelf life, freeze upon receipt for up to one year. Once thawed, refrigerate and consume within 3 days. Recommend freezing entire box of pizzas upon receipt and taking out each individually wrapped pizza as needed. Ingredients: Eggs, mayonnaise (soybean oil, egg yolks and whole eggs, water, distilled vinegar, salt, sugar, lemon juice concentrate, natural flavor) olive oil, mozzarella cheese (cultured pasteurized milk, salt, enzymes), tomato puree (water, tomato paste, salt, citric acid), coconut flour, water, garlic powder, baking powder (sodium bicarbonate, corn starch, sodium aluminum sulfate, calcium sulfate, monocalcium phosphate), xanthan gum, oregano, salt, baking soda (sodium bicarbonate). Contains milk, eggs and soy.